I very much enjoy listening to sermons and inspirational messages from around the country. They are readily available online and I enjoy being inspired by these great speakers as often as possible. I heard one such message yesterday from the C3 church in Orlando Florida (you can listen here for the full message) and felt the need to share as soon as possible. The message was about worry. The pastor shares how worry does absolutely nothing to help us, yet we often continue to make a habit out of it instead of focusing on God’s promises to move forward in our lives and accomplish our goals.The pastor then shares some excellent advice on how you can remove doubt by seeking God and His kingdom first, and relying on His promises to carry you through any obstacles to develop the necessary faith to accomplish God;s will for your life. This all occurred as I am in the middle of re-reading a book I have read several times called “The Power of Now” by Eckhart Tolle (further proof that God does things for a reason). This potentially life-changing book shares the importance of remaining focused on the present moment and “living there” as often as possible. As I heard the sermon last night, I instantly realized another excellent way to avoid worry. That is…remaining as often as possible in the present moment. When you remain in the present moment it is impossible to worry. If you don’t believe me, I challenge you to try it. What is worry anyway? It is fear about a future event. Even if that event is only minutes away, it is still in the future. When you remain squarely focused on the present moment you have full control. There is absolutely nothing to fear in the present moment. Even if there is some crazy situation happening (like you are in the middle of a street and a car is coming at you at that moment) your instinct will take over and you will act at that moment to avoid the negative situation. I find that when I place my full focus on the present moment, fear disappears instantly. And when I follow Jesus’s advice of seeking Him and the Kingdom first, a feeling of faith and power takes over what was once doubt and worry. It is then that I am setting myself up for blessing and miracles. The same is true for you. When you think of your greatest desire, or a goal you want to accomplish, what is the first thing you think of regarding the possibility of its completion? When someone asks you a question, what is usually your response, or even the tone of it? This answer usually depends on the quality of your attitude. When you have a positive attitude, and you think about the possibility of accomplishing your goal, you usually think in yes terms. When someone asks you a question while you are maintaining a positive frame of mind, you tend to answer in the affirmative. Of course, the opposite is true if you maintain a negative frame of mind. I am continuing in a series regarding positive attitude attributes found in Jeffrey Gitomer’s book, “The Little Golden Book of Yes”. Practicing these positive attitudes and making them habit can easily transform your life. It makes sense that thinking yes first can speed up this process. I share an exaggerated example, but one that proves this point very well. A great movie I’ve seen in recent years is a Jim Carey movie called “The Yes Man”. Carey plays a man who is generally unhappy in life, mainly because of focusing on fears which have led to a negative attitude. He attends a seminar which he is challenged to say yes to everything in life. He cannot say no. It leads to him leaving his comfort zone and trying some crazy things that he would have never thought to do before. However, for the first time in his life he feels a sense of adventure and fulfillment, and his life changes in many positive ways. These situations and relationships would have never occurred if he didn’t think yes first and had automatically thought no as he always did before. This movie really challenged me. Yes, it is an extreme and humorous way to teach a lesson, but it is one that has stuck with me in the years since I have seen this film. In many ways I limited myself because of an automatic no response, instead of thinking yes and seeing where it would lead me. I wish I can say I’ve completely gone away from the no thinking and letting fear rob me of potential blessings. However, I realize how valuable a yes attitude is and how thinking yes first can lead me and anyone else to receiving blessings I would never have imagined I have experienced these blessings and yes is my first thought. It is true that I may have to be uncomfortable and even inconvenienced, but the blessings and rewards far outweigh any discomfort. I challenge you to think yes first. You don’t have to say yes to everything. In fact, in the movie, Carey learns that it is not always possible and even beneficial to say yes to everything. However, do all you can to think yes first. At first, this may be a hard habit to break. It was for me, and as mentioned, yes is still not completely automatic. If your knee-jerk reaction is no, quickly bring yourself back and think how the no could be a yes. The more you do it, the easier it gets. And when you feel the wonderful feelings of the blessings and miracles it brings, you will be motivated to do it more. It’s been a while since I’ve written at this site. Or anywhere at all for that matter. I apologize to those looking here for helpful, uplifting information. Sometimes life takes over (or as in this case we allow it to) and energy is needed somewhere else. In many ways, 2015 has been an up and down year. I have continued to grow as a person and in my relationship with God. My entire family and I continue to be healthy and protected and enjoy a blessed life. However, in other ways, this year has been a step back. I have gone away from some of the great information and advice I’ve learned and share with you. As a result, I’ve experienced a stagnancy and more lower level emotions lately than the more energetic, higher vibrations that lead to greater blessing and enjoyment of life. As I asked myself how to get back on the right track, it didn’t take long to answer the question. 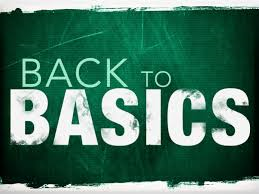 During other times in my life where I felt the same type of emotions, I succeeded by following a simple formula….get back to the basics. Other successful people in all fields follow the same advice. When a baseball player is in a hitting slump, he often returns to the very basics of hitting, from the stance, swing, and all of the taken for granted technical skills that made him successful in the first place. When a sales person is not selling, they often go back to the books and re-learn the basic skills of successful selling, once again doing the little things that brought big success. As I reflected on this back to the basics mentality, I was almost immediately lead to a valuable resource of mine. When I first began the path to self-discovery and personal development over 8 years ago, I found and read a book by Jeffrey Gitomer called “The Little Golden Book of Yes”. It was this book that helped me realize how much my own attitude made the biggest difference in life, regardless of the obstacles I was facing. It made me realize I was the only person that determined how successful my life would or would not be, and I was fully responsible. I would highly recommend it to anyone, whether you are just beginning your personal discovery journey or you just need to get back to the basics. It was also this book that led me to discover some other great books I read, such as “The Power of Positive Thinking”, “Think and Grow Rich”, and “The Secret”. These books then inspired me to do further research and learning which have taken my life to a new level and has helped me do the same for others. As I go back to basics, I am reading this book again (I’ve read it several times but it’s been a while). I realize I have learned a lot since the first time I read this book, but it has shown me how much I’ve been skipping over the basics lately, which is one main reason I am feeling like I am not where I want to be at this point. I also realize that if I begin to once again follow these very easy basics, I will quickly get back to my own personal growth and satisfy the desire to bring many people to a higher level in their lives. That is where you come in. As a way to help myself get back to basics and get back to writing, I will share over the next few weeks some of these simple basics that can make major positive impacts in your life. It’s just a matter of getting into the habit of doing them on a regular basis. In the book, Gitomer presents a Yes Attitude self-reflection and report card. There are 22 personal attributes where you rate yourself on a scale of 1-5. At the end, you add your score and he tells you where you stand regarding your attitude attributes. You are currently browsing the Power of PIES blog archives for November, 2015.